We don’t eat beef often. Over my life time I’ve eaten enough meatloaf and hamburgers to do me in. I have never been a huge fan of steak – since I am picky and like it cooked only one way. This past Friday, my Hubby brought home beef short ribs. I looked them and then I looked at him. I gave him the sideways look that a dog gives its owner when it can’t figure him/her out. I didn’t want to rain on my hubby’s parade, so I promised him that I would bake up these lovelies for him. And he was happy. I was however, clueless on HOW to bake them. 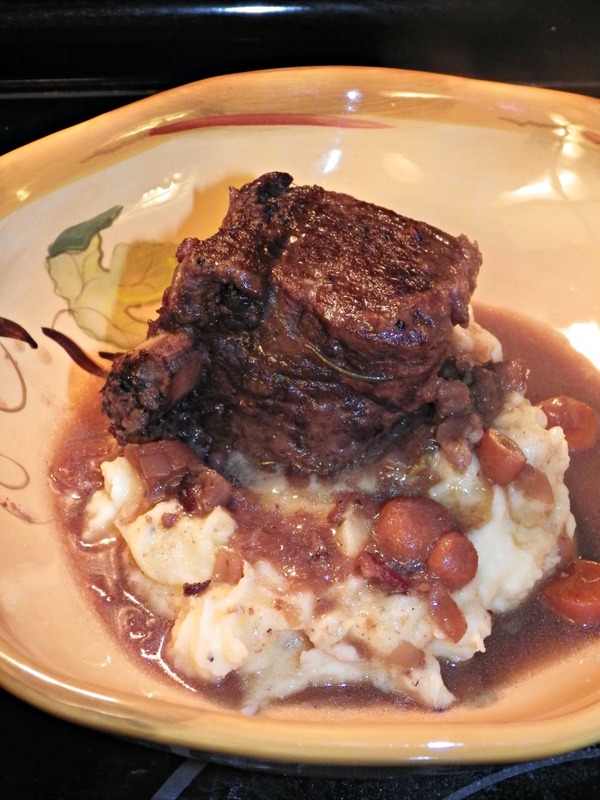 So I ran to Pinterest and I found The Pioneer Woman‘s recipe for Braised Short Ribs. I have loved all but one of the recipes I’ve tried from her website – and that was because I used too much butter on her garlic bread recipe. So, that really wasn’t her fault. I’ll admit to reading one or two more rib recipes. But I didn’t want to use the slow cooker, and really wanted to use my Le Cruset dutch oven. This recipe was so easy to do! Everything came together quite quickly and the house smelled divine from beginning to end! I made no changes to the recipe and within 2.5 hours I had the deliciousness that you see above. I’ve now printed this recipe and it has gone into my MUST make again folder. Seriously delicious, seriously easy and seriously… my entire family ate every last bite – which hardly ever happens! Nom nom nom!